Janice and Leon Boyde of Pembroke with their daughter, Jennifer. Janice Boyde spoke about her and her daughter&apos;s journey living with a developmental disability at Road to Responsibility’s 30th anniversary gala Sept. 21. 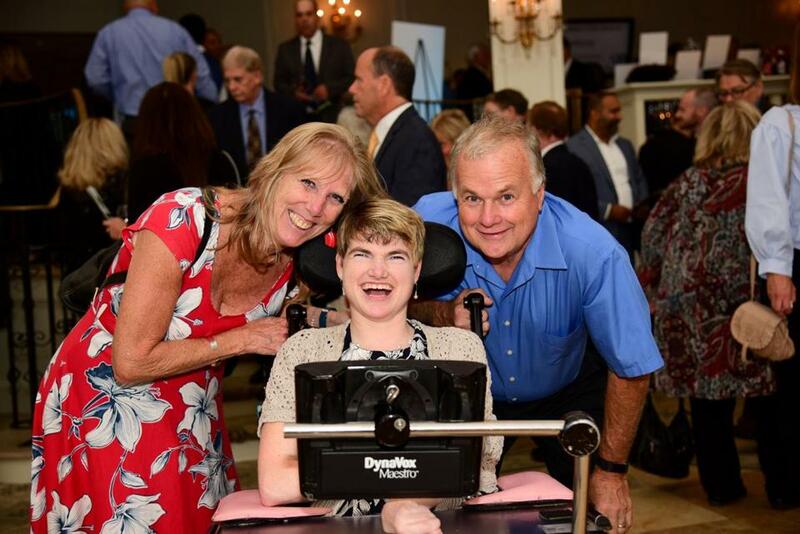 A Marshfield-based nonprofit supporting people with disabilities raised nearly $300,000 at a gala last month. Road To Responsibility raised the largest amount of money in at least 10 years at its annual Making Lives Better Gala. The 30th anniversary gala featured silent auctions and donated raffle prizes, cocktails, dinner, and music. Donations ranged from $100 to $10,000. The nonprofit serves more than 100 communities south of Boston, operating day, residential, and transitional rehabilitation services for individuals with disabilities. Visit www.roadtoresponsibility.org. A nonprofit reading service that broadcasts newspapers, magazines, books, and consumer information announced its keynote speaker for its 40th anniversary gala in Quincy. Sinead Kane, an accomplished Irish athlete, lawyer, and inspirational speaker with impaired vision, will do the honors Nov. 1 for the Marshfield -based Talking Information Center. The gala will be held at Granite Links Golf Club, 100 Quarry Hills Drive. Ed Perry, founder of the nonprofit and owner of radio station WATD, will also be honored. The event will include a four-course meal and live and silent auctions for items such as a 10-day trip to Australia, donated by Esplanade Travel. All proceeds will go to the organization, which serves the listening needs of 30,000 visually impaired or otherwise disabled listeners throughout Massachusetts. Tickets cost $150 per person. Visit www.ticnetwork.org, call 781-834-4400 ext. 203, or e-mail adunbar@ticnetwork.org. A theater company in Norwell is hosting an advocacy class for young actors. The Company Theatre will offer “Actors, Safety and Self-Advocacy,” on Sunday, Oct. 21, at 30 Accord Park Drive. Students will learn how to set personal boundaries and who to talk to when they have safety concerns. Performers over the age of 14 can attend the class, which begins at 11 a.m. and costs $25. Visit www.companytheatre.com. A New York Times bestselling novelist will speak about his novel and Native American issues at a Scituate school. Tommy Orange, author of the novel “There, There,” which explores issues Native Americans who live in urban environments face, will participate in a discussion led by writer Nina MacLaughlin on Oct. 25. After the discussion, Orange will be available to sign books. The event at Inly School, 45 Watch Hill Drive, begins at 7 p.m. Tickets cost $10 and can be purchased at www.inlyschool.org/speaker-series. A veterans’ housing community in Brockton was recently recognized with a Community Advocate award for serving the community by the state Department of Veteran Affairs. Howard Apartments is a permanent supportive housing community for formerly homeless veterans with on-site VA case management located at the Brockton VA Medical Center. The Homeless Veterans Community Advocate Award reception honored Peabody Properties, a Braintree-based property management firm, for its collaboration with Howard Apartments. Peabody Properties manages the property, furnishes the apartments, and coordinates on- and off-site activities and holiday programs and events, according to a news release from the firm. The South Shore Habitat for Humanity raised over $30,000 at its annual Ride for Habitat in Hingham. The race offered 15, 25, and 50-mile loops for bicyclists. More than 60 riders participated in the ride along South Shore back roads with ocean views. The Weymouth-based nonprofit builds affordable housing for people in need in 35 communities south of Boston.Visit www.sshabitat.org.